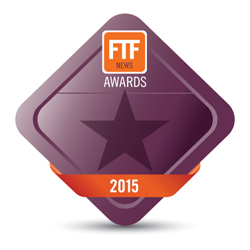 FTF News is pleased to announce that voting is now open for the FTF News Technology Innovation Awards 2015! Nominations closed on February 20, 2015 and were then considered by the editorial panel before the short-list was finalized for voting. WINNERS ANNOUNCED: April 21, 2015, at the FTF DerivOps North America conference. DATE OF AWARDS DINNER: June 2, 2015, following the conclusion of the FTF SecOps USA conference. The awards ceremony will be held at the Rainbow Room, 30 Rockefeller Plaza, New York, NY. Voting will take place online March 4 - March 25, 2015. Individuals may NOT vote for their own company (this includes PR firms that represent nominees) or a  subsidiary or parent company of the nominee. These votes will be automatically disqualified. Votes can be made by industry peers, clients and other relevant industry professionals. Please do not ask  spouses, siblings, children, parents, grandparents, random friends or pets to participate in the voting process. Only votes from business e-mail addresses will be considered. Votes from personal e-mail addresses will not  be counted. We highly encourage nominees to ask their clients to take part in the submission and voting processes. Simple, right? We think so.